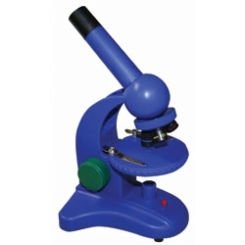 Constructed of sturdy plastic, this basic portable microscope is ideal for children learning basic functions and components of a microscope. Available in a vibrant blue color with non-removable parts for safety. Best for elementary school grade students. Please note: This item cannot be rush shipped. Please allow 3-4 additional days for delivery.